Nissan responds to Porsches accusations that they couldn't go faster than 7:54 at Nurburgring with a Nissan GT-R. I think they wanted to say "You can't drive". o On September 24, 2007 the Nissan GT-R recorded a lap time of the Nordschleife circuit at Germany's Nurburgring of seven minutes and 38 seconds. This lap time was completed in weather conditions that the Nissan test team knew would not show the full potential of the car. o On April 17, 2008 the Nissan test team was back at the Nurburgring and recorded a new lap time of seven minutes and 29 seconds, several times. o For all testing at the Nurburgring and other circuits such as Sendai Highlands in Japan, the GT-R development team used production specification vehicles with production specification tires. These tests are part of the extensive performance and durability program undertaken before, during and after the commercial introduction of the GT-R.
o The GT-R is a world-class supercar developed to be sold in multiple global markets. While specifications can differ across the various markets, the cars used to record both Nurburgring lap times were identical to the Japanese market production specification cars. o For the April 2008 test, the GT-R carried an additional 50kg of weight due to the Marelli data recorder and video camera equipment. In addition, the test was witnessed by 'Best Motoring' magazine from Japan who reported the test in their July 2008 issue, which included a DVD program of the session. o Nissan records the lap times around the Nurburgring using the same methodology and measuring locations as Sport Auto Magazine in Germany. Sport Auto Magazine provides the most consistent and objective measurement of lap times around the Nurburgring, allowing accurate comparisons between different vehicles. o In both timed lap sessions at the Nurburgring, chief test driver and professional racing driver, Toshio Suzuki was at the wheel. 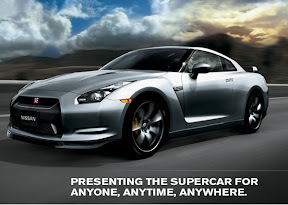 Suzuki has been the chief test driver on the GT-R program throughout the vehicle's development. o For the tests conducted at the Nurburgring where the lap times of 7:38 and 7:29 were recorded, the Dunlop tires were used. The tires – which are designed for high performance driving in the dry and wet - used in the tests were identical to the production specification tires available to GT-R customers. o For any media interested in seeing the actual tires used at the test (7:29 lap time), they should contact the Public Relations Department at Sumitomo Rubber Industries, Ltd. in Japan. o Consistent with industry benchmarking practices, we are aware that several auto makers have purchased the GT-R for their own testing and evaluation. Like all GT-R customers, we recommend that any auto maker buying a GT-R should follow the recommended run-in procedures, service schedules and maintenance to ensure the maximum performance from their car. o In addition, we offer performance driving courses for prospective and current GT-R owners to help them get the best performance from their car. We would welcome the opportunity to help any auto manufacturer with understanding the full capabilities of the GT-R.
And the ball is returned into Porsches court.